I’d like to hear more about this wonderful shot. Are you still in Scotland? I know you don’t use a tripod. Were you using a fast lens, perhaps with a high shutter speed? Thanks, Kirk. I used my trusty Nikon 35mm 1.8 for much of this trip. It’s light, fast, and good in low light, which makes it perfect for travel. It also takes amazing photographs. This shot was in A mode, F4, 1/400, ISO 200. Thanks for the details, Sharon. I”m trying to get better with taking photos and I always like what you do. This is a beauty, Sharon. Love those delicate water drops. Thanks, Frank. It was a typical Scottish morning with low light and misty air. The Nikon 35mm 1.8 never fails me :). Sharon, this is lovely! 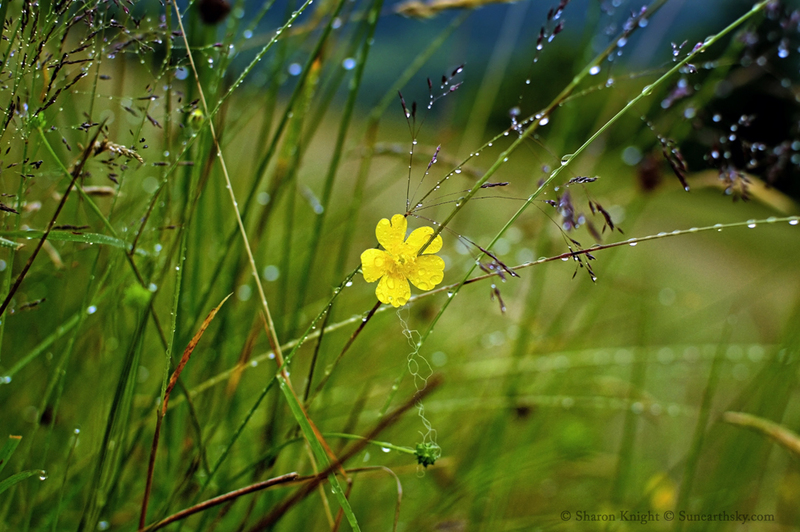 You’ve managed to have us focus on the simplicity of the yellow flower and the beauty of those dew drops.